This one’s for my sister. Every inch of my body screamed, "I can't do this again. I need to leave. I can’t handle One. More. Moment.” I felt agitation running through my veins, anxiety rising in my chest. Resentment and anger came bubbling up as I thought of all the families sitting down to their Thanksgiving dinners while I found myself in a room alone with my mom, inside of the assisted living facility we had moved her into two weeks prior. She was downright refusing to get dressed and come with me to join the rest of our family for the meal. Or maybe it was her disease, the PCA, that was refusing to come. The thing was, I really couldn’t convince my mom to come with me. While I was seeing red inside of my reptilian fight or flight brain, I knew enough to know that I was not mentally in a place where I was going to be able to connect with my mom, get on her level, empathize. Get her dressed so I could be with the rest of my family who were already together, waiting on us. So I called Dani. Isn’t this what we do as siblings? I would do this to no one else on earth (well, except maybe my husband - sorry babe). I’m so resentful in this moment, I’m letting my emotions get the best of me by attacking my sister in my mind, I know she already feels horribly guilty about leaving me alone to deal with the situation, and I decide to call her? And, you know what? She answered. Thinking back on it now, I have tears in my eyes. Tears of deep gratitude for Dani. Put yourself in her shoes for a moment. After months of crisis, I mean crisis every damn day for weeks on end where you are pulled from meetings at work and bedtime with the kids to take care of our mom. Off to the neurologist, the psychiatrist, the ENT. Off to the emergency room. Off to a meeting you’ve been called to with the director of the facility. It is only us. Her and I. We moved her here away from her village and so it is us and only us who are responsible. Dani has finally gotten an opportunity to take a moment to breathe. A few days where she can be with her two little kids and focus on them with her full attention because she knows that even if she gets called she can’t physically come. It’s a huge weight lifted for a few precious days. And I evidently wanted to sabotage it for her. Not only did she answer the phone, but she answered it free of hostility, even though she had to know it was an SOS call from me before she picked up. We had been answering each other’s calls with, “What happened?” for the past two months. But on Thanksgiving she sounded happy and peaceful when she said hello. Immediately upon hearing her voice I started to relax. I put her on speaker and she spoke to our mom in the way that I wasn’t able. She soothed and listened and comforted. After we hung up, I got mom dressed and off we went. For years people have told me, “It’s good that you have your sister.” For a long time, I wanted to respond by saying that having a sister doesn’t make the pain go away, you know. It’s still the hardest thing I’ve ever faced. “You’re reminding me of my sister because you want to create distance between yourself and this hardship I’m in; it’s easier to sugarcoat it with my sister rather than acknowledge the pain, isn’t it?” I wanted to say. This year though, a deeper level of gratitude than I have ever felt before, came into my life. We have walked through the hardest days together, Dani and I. Facing the depth of this disease together, the stripping away of the woman we both love dearly has bound us together in the most beautiful way. We have chosen, time and again, not to scream at each other. Not to take our pain out on each other. But to support. To be the other person’s person. To love. Now when people tell me how lucky I am to have my sister I close my eyes and say a prayer. Thank you for Dani. Please keep her safe. Please protect her energy and bring her peace. I opened the email and scrolled. Here's what you should do. Here's why that's not the right decision. Here's where you should look and who you should talk to. When I first started getting these emails from people who do care about me and my family a couple of years ago, I would feel the need to consider and explore all the options presented. I didn't want to overlook something important or fail to consider an option. Over the years, I've gotten much more clear about who has a say in the decisions I make for my family. Instead of "Thanks for your input! ", I'm turning to "Thanks, but this is a personal decision and we are not looking for outside opinions." I know some of you reading this today are in the middle of a big decision. If not a decision, perhaps a time of transition or a time of hardship/messiness/distress. Everyone and their mother wants to give you advice about what to do. Does this ring true? I've made several huge, even life or death decisions for my family, and I'm currently in the middle of another big family decision. I thought I would share what I've learned in the event that you too feel like a sailing ship at the mercy of the waves and weather. 1. Who's on your team? You know, the decision-making team. It should be people you trust 100% without a single ounce of doubt. All other voices get shut out. Be ruthless. My therapist taught me a visualization where you picture a safe. Open up the safe, put all of those outside opinions in there, close it and LOCK IT. 2. There isn't a right decision. I mean, maybe sometimes there is, but in my experience, there is often not a perfect solution or an obvious right one. You are not allowed to beat yourself up for making the "wrong" decision later. I've been stuck in this trap before and it can lead to dark places that are hard to pull out of. I continue to work on untangling myself from the idea of a right or wrong decision. 3. Make peace with yourself and let go of the outcome. Even when we do all of the research and have the absolute best of intentions, sometimes it doesn't work out the way we want it to. Sometimes the decisions we make go against the wishes of the person we are making them for. Your job is to look at the absolute biggest picture, the eagle's view, and ask yourself no matter what the outcome is, will I be able to live with this decision? I hope this brings you a little bit of comfort. I'm over here, in your corner. I've had a rough week full of disconnection with my nine year old daughter. Today I noticed she was getting dressed without prodding, brushing her hair and doing what she needed to do to get out the door on time for school. I was so proud of her and she seemed so beautiful and precious to me in that moment. I made eye contact with her and smiled. Not a huge wide-toothed smile, but I felt my facial muscles move into the place they go when I smile. She stopped in her tracks when she saw me staring at her and said, "What?" Let's just say I sensed some venom in her voice. I just love you and I'm proud of you. Then why are you giving me that look? I'm smiling at you babe. That's a frown trying to be a smile. Here I was showing up with the absolute best of intentions trying to connect and she still didn't see it this way. How bad must it feel when I'm reacting out of a place of anger or irritation? It was a reminder of perception and how much our kids feed off of our energy. We have to literally ask them the question to make sure we are on the same page. This applies to all relationships in our life. With our partner, at work, with our friends. Unless we have the courage to check in, "You seem a bit off today, did I say something that upset you?" we could be two ships sailing on different rivers, in opposite directions. What is one thing that motherhood has taught you this month? For those of you without kids, simply substitute partnership or yoga or nature or life for "motherhood". I’d love to read your response - email it to me! I don't consider myself a mommy blogger. In fact, I tend to feel on the outside of most groups of Mom peers. At a writing workshop I attended we were each instructed to write a one line response to "What I know" and I wrote: I know how it feels to stand in a group of moms and feel utterly alone. What I also know is that this is more about me than the other Moms. It's my attempt to shield myself from the judgement of the Moms. For a while the only coping mechanism I could muster was to hold up the shield and crouch down behind it. I've spent a lot of energy trying to understand that other people's opinions of my parenting choices or my children are their business and have nothing to do with me. I've also spent a lot of energy trying to be the mom my child needs me to be in all settings, not just when it's most comfortable for me. These continue to be works in progress. All that said, when you find a beautiful soul who understands your motherhood journey, it is such joy. Sharing openly about the challenges and the hard times is crucial for who we are at our core. One of the greatest gifts of Orchid Story is that the women who feel compelled to join this community are kindred spirits who also believe in this. You all are the moms I want to stand beside and I want to open up to. It is with this energy that I joined forces with the amazing Kristy Rodriguez of Pure Nurture to offer a FREE community event for moms. Our salon, Your Motherhood Narrative, is happening the evening of Friday September 7th. Go here for more info. I know firsthand how important it is to have spaces and people to share our motherhood experience. This is one of those. I hope you'll join us. In the spirit of serving, creating community and engaging with like-minded people, I will also be participating in an Open House at the Insight Shop on Saturday September 8th. Have you ever thought to yourself that you think you would like to attend one of my workshops or classes but you aren't sure? This is just for you. Come get a sense of who I am and how I teach. It's FREE and no registration is required. If you live in the DMV: Come to one of my free events this week. Registration is required for the Your Motherhood Narrative salon and there are only a couple of spaces left. The Open House does not require registration. Both are FREE. Give yourself the gift of investing time in yourself and I have a feeling you won't be disappointed. This is the perfect way to sample what I'm offering. If you live outside the greater DC area: I believe so strongly in creating space for these conversations that I will host an online, video format of the Your Motherhood Narrative for FREE if I have at least eight people email me and tell me they want to attend. Share this with a friend if you really want it to happen! My response to the exercise: pick one photo you love from this summer and give yourself 15 minutes to write a reflection on it. It was a gorgeous day on the shores of the Outer Banks, NC. Day seven of our vacation; the last day. I was sitting in my beach chair next to two of my dearest friends drinking cheap, too-sweet wine from the snack shack up by the parking lot. The kids, seven of them in total, fanned out around us. A couple were in the water with their boogie boards, a couple digging in the sand, a couple digging for M&Ms in the trailmix. Every 30 seconds or so one of them would come over to the three chairs to whine about their brother stealing their shovel or to ask for help with a towel. In between the stop-bys, it was heaven. My portable bluetooth speaker hung from my chair playing the beach party playlist and I was reading "The Execution of Noa P. Singleton" by Elizabeth Silver. Just two weeks later I would actually get to meet the author and I was thrilled about the prospect. My kids happened to be among the eldest of this gaggle of children, which meant that I was actually reading my book, one to two pages at a time. After many years of barely sitting on the beach, this was exhilarating. Just being near my girlfriends made my heart sing since busy schedules meant getting together back at home a challenge. As one of my friends sat back down in her chair and sighed, Ahhh, this is awesome!, I thought back to my own childhood, where we went to the lake, instead of the beach. My mom was also with her best friend on these vacations, similar to our annual Outer Banks trip. Each morning, after coffee and reading on the porch, my mom and her bestie would head down to the dock to set up for the day. They "owned" the two lounge chairs on the lower dock. The kids were allowed to use the lounge chairs on the upper deck. I don't think any of us kids ever even attempted to sit in a mom chair. The five of us kids, all girls, occupied ourselves all day with little involvement from the moms. Our Barbies went bungee jumping off the high deck, we rock-jumped, sailed, created plays and performances. We made our own lunch and our own fun. It was simply understood that the moms were not to be bothered while they were in their chairs. This was a pretty stark contrast to my own vacation where us moms packed enough food for an army and were constantly jumping up at the whim of our kids. My own kids were definitely at the age where they could be doing more for themselves. Gosh, was I more of a helicopter mom than I realized? Was I setting my kids up to be entitled? My thoughts were interrupted by my nine year old, Carly, who bumped the big red gummy bear float into my chair and asked me to go into the water with her. I'd said no a lot of times in the past week. Despite loving the beach I don't have a fondness for going in the water. I almost shouted, The moms are not to be disturbed right now! Instead, I paused for a moment, remembered it was our last day and thought about how I try to say yes to her when I can, since she gets so many no's. Ok, let's do it, I said and followed Carly and the gummy bear float towards the water, the sound of my beach playlist fading behind me. What is the story your photos tell? I'm getting ready for my Hero's Journey workshop this Saturday in Vienna, VA (we still have a few spots left! come join me!) and in doing so I've been thinking about both the literal and figurative journeys I've been on this summer. I had a deep realization in recent weeks what a privilege it is to be able to travel. Take a second to be filled with gratitude for the the places you saw, the foods you ate, the conversations you had. I'm sure it's the same with you. Lots happens over the summer - we travel to new places, we spend more time with people we love, we read lots of books (I read a ton of books this summer - maybe I'll do a roundup for you soon). Then, we get to the end of August and school is starting for the kids, we are rushing around trying to get everything ready and before we know it we're celebrating Rosh Hashanah and attending weekend soccer games. The summer feels like it was years instead of weeks ago. You don't need kids to understand and live this phenomenon. We are wired to be thinking ahead and planning for what's next, constantly. Taking a moment for reflection fills your soul. It reminds us where we've been and what we learned. Or why that trip was so important for you to plan and take in the first place. One fun and simple way to access this journey of yours is to open up your photos on your phone. Pick one you love and give yourself 15 minutes to write a reflection on the photo. Like the idea but know you won't actually carve out the time to do it? Check out my new calendar of events to see how I can support you in telling your story. 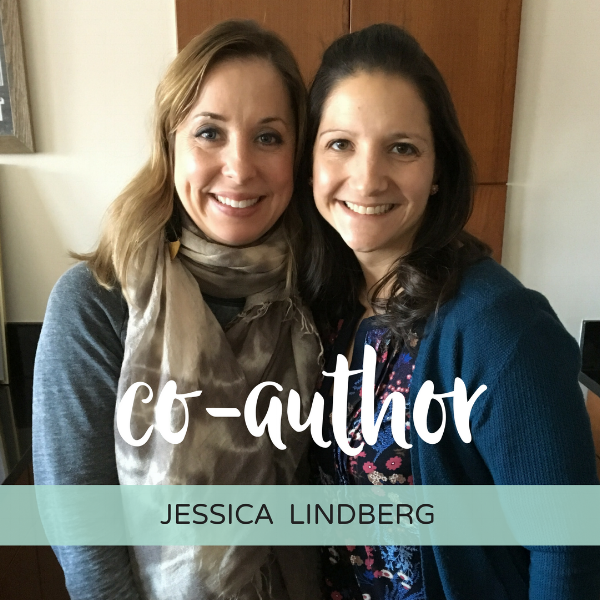 I met today's co-author in mothering, Jessica Lindberg, during my pregnancy with Griffin. Back then her foundation had a different name, but today it's known as the Ethan Lindberg Foundation, named in memory of her son, Ethan, who died of congenital heart disease. Jess was a mentor when we entered the scary world of pediatric cardiology - a place no parent wants to find themselves. She led with love and showed me and many other heart moms what it looks like to walk this path. I learned most from Jess during the last months of Ethan's life. She wrote often during that time and took her readers on the journey of what it is to walk to the end of the earth for your child. I often talk about taking a flashlight to the dark, unknown places in life and Jess did this beautifully. My heart broke open for her. It was the first time I had been close to the intense mother's struggle for a child's life and what comes after for the survivors. What a gift this was to allow me and others into her journey. Jess is one of those people in my life who I feel I was destined to meet. We have other connections too, that have to do with her youngest son, Bodey. There are too many commonalities for our friendship to have been a fluke. Though I've known Jess for many years it was not until 2018 when we finally met in person. This picture is from that weekend. I can't imagine going through life and not connecting with Jess - and I never would have met her if Griffin had a normal heart. Another example that life-giving connection can come from the darkest places. I'm honoring Rev. Julia Jarvis on Day #5 of my co-authors in mothering. I first met Rev Julia, as she is affectionately known by her community, when I was pregnant with my son. My daughter was just over one year old and I was trying to grapple with the diagnosis of congenital heart disease in my unborn baby. If this wasn't divine timing to be introduced to the most welcoming spiritual community, the Interfaith Families Project (IFFP), of which Rev Julia is the spiritual director, then I don't know what is. We had been floundering around, looking for a spiritual home, for a couple years at that point. The churches and synagogues we visited didn't sit quite right and we weren't interested in the shame game that many of them played when viewing Interfaith couples like us. I first came across IFFP in a Washington Post article and it felt a little too good to be true. It wasn't. I knew from the first five minutes of attending the first time that we had found the place we belonged. The years of wringing our hands and trying to pick one or the other religion simply melted away when we discovered IFFP. This may sound a little extreme, but if you spent time with Rev Julia you would get where I am coming from. Every sermon she gave during my pregnancy with Griffin brought tears to my eyes. I was in a delicate place, yes, but I was also legitimately moved by her words. She was speaking directly to my most fragile place. She saw it and didn't turn away. I felt that in the presence of this wise woman, everything would somehow be ok. There were not many other instances during my pregnancy when I remember feeling that kind of clarity. For years and years growing up, I attending the same mass at the same time every week. The priest never knew my name. Rev Julia learned our names that first time we visited and has embraced me and called me by name every week since. This image is a little snapshot of what this woman is made of. She collected over 100 of these aspen leaves on a trip to New Mexico, brought them home to Maryland and created these touching "We are all in this together" keepsakes for each IFFP family. Friends! This month, I'm going to focus on moms in honor of Mother's Day. All moms are created equal, whether you are a mom or not, have a living mom or not, have an adopted mom or not, have a relationship with your mom or not, and any other variation you can think of! 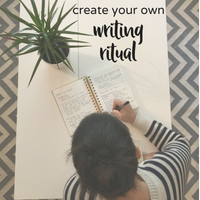 All of the writing I do will be in the mom theme - shared on social media, my website or wherever. I want to hear from you too. I am going to take the responses to the questions I pose and create something beautiful. It may be a video or an image or writing piece - so inspire me and be on the lookout for what I create with your words. You'll need to follow me on social media to get involved. I'll be on Facebook and Instagram. I am making a Mother's Day video for one of my amazing Orchid Story community members. To be in the running you need to be signed up for my newsletter (look right on this page to sign up). This is a gift from me to show my gratitude for showing up, reading, and sharing my work. The 1-2 minute video will include your audio story (recorded with me via Skype) with background music and your personal photos. This will be a super creative and unique way to say Happy Mother's Day to someone in your life. In the story of your life, what's the title of the chapter on Mom? I'll pick the winner and email that person on Friday May 4th. Remember, this doesn't have to be about your mom - I'm looking for any mom that has positively influenced your life. The final product will be shared with my community. Yay! Very excited to do a free giveaway for you in honor of moms everywhere. 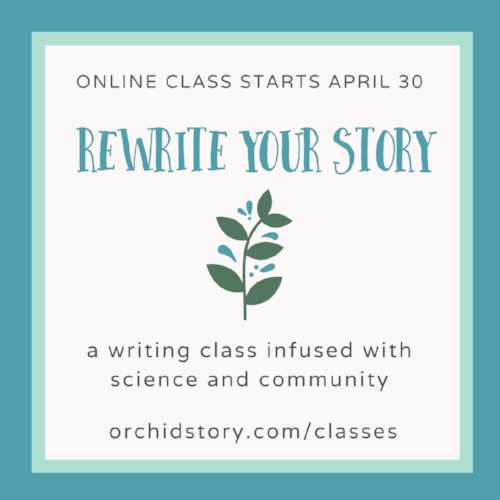 Enrollment is OPEN for Rewrite Your Story - the Online Class. I am so excited to bring an online version of my class to you! I can reach more people in an easy-to-access way and maintain a community aspect with a limited class size and a couple of live sessions. Applications open on Wed April 18th. The class is six weeks and mostly self-paced. If you sign up to get on the waitlist you will receive a special discount code. Thank you! Doors open April 18th and you will be the first to have access to the application for class. This class is for you if you've experienced a challenge in your life that divided it into the before and after. A part of you is the same, but a part of you is different. The story of your struggle is stuck in your head and you don't know how to integrate it into your life. I've been there. I've done it all - therapy, support groups, self-help books. They each have a place. As does rewriting your story. See, the stories we tell ourself become part of our personality. This is called our narrative identity. Our narrative identity affects our emotional and physical health on a daily basis. If we make small changes to the way we see our stories, we can make drastic improvements to the way we feel. There is research to back this up. I've been working with this idea of narrative identity for a couple of years and I have seen evidence in my own life that it works. The best part is that you don't need any special tools or even a huge time commitment. Short bursts of dedicated writing time can lead to big improvements. This process helps build resilience. You'll feel more energized in your day-to-day and you'll bounce back more quickly the next time something unexpected happens. Some studies even show that writing about your story lowers your blood pressure. Join me. My superpower is taking complicated scientific concepts and breaking them down so that you can benefit. This is my passion. I hope to see you in class! p.s. Click here if you live in the DMV and you are interested in joining me for my 6-week in-person class starting May 2.